Good looking team aren't they? We got a call requesting an appearance of our golf playing robot at the 2nd annual SBPLI Golf Fundraiser held July 28 at the Stonebridge Golf Club in Hauppauge. It was a bright hot day with some cooler cloud cover coming in about the time we arrived with five students and an advisor to setup on the putting green and range in the robot on one of the holes. Golfers began drifting in as they finished their rounds and the cocktail hour began about 6 o'clock. Some tried their putting against the robot's and occasionally some golfers placed their balls closer to the hole than the robot, and were awarded raffle tickets as a prize. Most lost as the robot dropped it's putts into the cup. Central Islip has pulled a rookie team together, so we had the lead teacher over, then began mentor visits once a week. 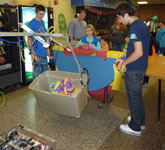 The Islip robotics students drove our 2010 robot in a lap around the school using inside hallways, drawing stares and attracting comments. We left them with the 2010 robot to study and play with and tentatively planned workshops on programming, the kitbot, and electrical/control system. They are also invited to shadow Hauppauge at our off-season competitions. For Deer Park the Regional Director has sent out an appeal for the loan of unused robots. North Shore HS is the other local area rookie team this season. They participated at Deer Park as part of the Great Neck team. 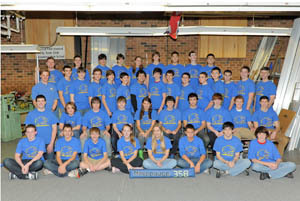 Mr. McLeod did a series of 4 rookie workshops using the same Kit chassis as was used to train Central Islip students. The day before Homecoming we supported SBPLI by demonstrating LogoMotion at a Manufacturing Symposium held at Suffolk County Community College's Brentwood campus. Three teams were there, Hauppauge, Westhampton Beach, and Bay Shore. We brought our tube rack and lots of tubes, some loaned by Smithtown, and we all just drove about putting tube up on the rack and taking them down again. We were given a large 30x30 carpeted exhibit space right in the center of all. Students spoke to visitors and got to tour the booths talking to industry folks. The college also took us on a tour of their extensive machine shop facility. 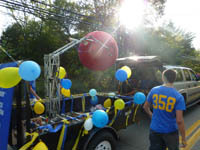 The Homecoming parade used the Bosi's trailer and SUV on a bright sunny day. The trailer was decorated, one of the big ball robots was used, gripping and raising the enormous red ball from the Nascar year. We handed out candy as usual, then at the field we had a table and the minibot pole to run robots up. We sold tickets for our pancake breakfast fundraiser at Applebee's and Twizzlers donated by one of the parents. Safe Halloween was a rainy, blustery day. A lot of children showed up anyway. We used our 2008 robot to catch orbit balls thrown by the trick-or-treaters running through batteries at a fairly regular pace - we'll need to buy more spare batteries this year! The arm broke a shackle by completely bending it out of shape, then after that was replaced we ran a while longer before the pin holding a sprocket to the motor shaft also broke. So for the last half hour or so the robot dodged by driving alone. Our Fall off-season events are among our favorites. We planned to attend two off-season events this Fall. Unfortunately, Deer Park couldn't get a FIRST field except for one of the SAT Saturdays and the same date as the Brunswick Eruption, one of our other traditional off-season events, so we first decided on a substitute event, but Francis Lewis in Queens had a number of teams drop out at the last minute forcing a late cancellation of the event. Field setup was Friday night and everything checked out fine. Saturday morning we lost the team lights (not critical), but didn't quite understand why until later. All the field, DJ, team electrical stuff finally overloaded a circuit breaker and we had a power outage (thankfully between matches) during the Elimination rounds. Some quickly rerouted power cables and a reset breaker solved that problem and after 10 nervous minutes (for the field crew) the rest of the event went smoothly. Oh, after rerouting the power cables we also got enough power to get the team lights and field timers back and operating. With a round number of 18 teams our FTA was able to devise an Elimination playoff that left no one out. We had a fundraiser at Sears Hardware in Hauppauge where we got a % of total sales on Sunday. We took a couple of robots there for display. Several team alumni (Ben Solaski & Chris Fortmeyer) joined Mr. McLeod at Central Islip helping get the rookies started with their designing and prototyping. Mr. McLeod got interviewed several times by MSG Varsity for a piece they were doing following three teams, including Central Islip as rookies. CI also came to build in our shop a couple of Saturdays before Bag day and we helped them get their robot driving, then they joined us the last Sunday for final tuning and skins. The final weekend was extremely crowded in the robotics room. Three other schools joined us, and yet another kept dropping by to borrow joysticks and cables, mostly because they were locked out of their school shops during the mid-winter break. Half Hollow Hills moved in for two days, Hicksville and Central Islip can to test and refine their robots in our practice area. It was really fun to have all the students mixing and comparing robots, design ideas, and notes. Our freshmen got great exposure to what FIRST really means as they worked with those they thought were supposed to be their opponents. We registered for LI and Championship, but were wait-listed for the WPI Regional and didn't hear anything from FIRST for the longest time. We tried contacting them, but they wouldn't discuss our chances or options as a matter of policy. We contacted them a final time and got permission to switch to the Chesapeake Regional (same week event), but had to make frantic school and travel arrangements to attend. Everyone was eager to play though, so we made it happen. Thank you Mrs. Bosi! This year for build season we ran behind our usual schedule and were very late in getting our robot together. We did a lot of prototyping and had a same drive train running early as we tested and explored ideas: Catapults, shooter wheels, ball pickups, gravity feeds, bumper heights, mid-field bumper climbers. Just as we began final assembly of the robot only two weeks before the Bag date, we discovered one of the shifting gearboxes (already mounted) had been delivered without a necessary keystock. We had to not only tear the gearbox down and rebuild it, but since we couldn't be sure the other gearbox didn't also suffer from the same problem, we had to disassemble the whole robot down to the frame to get the other gearbox out for inspection. It turns out it was fine, but there we were with a pile of parts and only days to go. 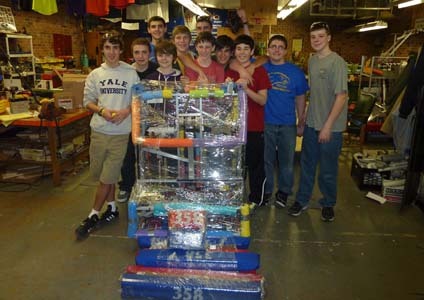 We persevered and the mechanical systems came together three days before Bagging. Electrical got the robot on Sunday, programming got to touch the robot for an hour on Monday, and the drivers got to balance on the bridge by Monday night. Tuesday morning we fixed some problems, did some test shooting in the auditorium (while the musical stage crew-also behind-worked). We followed up with some test shooting in the robotics room and modifications of the controls, finished up the bumpers and robot skins and came in under weight at 117.5 lbs. As we bagged the robot, it looked a bit like Mardi Gras, because we covered all edges and corners with leftover multicolored pool noodles, so the bag wouldn't be damaged from the inside. Then the robot was wrapped in shipping plastic, and finally Bagged & Tagged. We stored the finished product in the robot crate so it would feel at home and we wouldn't have to look longingly at it for the weeks until competition. So, on to our first competition event, the Chesapeake Regional. It was our first time attending this in downtown Baltimore, MD at the convention center two blocks from the Inner Harbor. We chartered a coach bus leaving from the high school after classes on Wednesday. Right off the bat things diverged from our plan. The bus company had run out of the standard coach buses, so what showed up, but a Luxury coach bus. Pity poor us - WiFi, power outlets, extra roomy leather seats, free water bottles, bags of chips and cookies, a magazine rack, movies of course. We watched Spaceballs and half of October Sky on the way south. We stopped at the Delaware rest stop both on the way down and on the return trip Saturday night for dinner. We stayed at the Marriot at Camden Yards, a block from the convention center. The weather was bright, sunny, and warm with trees and flowers beginning to bloom as we walked back and forth. This year the robot was sealed in an oversized clear leaf back, like some large leftover, and we had to transport it ourselves in the belly of the bus. So the hotel stored it on it's cart in a spare room until we could wheel it over to the convention center in the morning. We got a few looks wheeling a 4.5 foot robot down the streets of Baltimore. 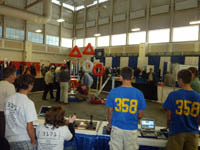 We had minimal work to prep the robot before passing inspection and getting out to the practice matches. Being inspected early meant we could stay on the field all morning and afternoon filling empty practice slots while the drivers figured out how to setup for autonomous, shoot balls, drive, and balance the bridges. All that practice paid benefits as we made most of our points balancing (the coopertition bridge made for a LOT of ranking points) and finished in 11th place, eventually moving up to be the 7th Alliance Captain. We asked team 714 from Newark, NJ and team 2068 from Manassas, Va to join us in a terrific alliance that drove all the way to the finals, becoming the Silver medalists. Woodie Flowers was there and the whole team got to sign his shirt and pose with him. We started strong at the Long Island Regional at the Hofstra Arena. Mechanical issues in our shifter kept us in low gear for the event, but fortunately that happened to be the gear that the driver's preferred anyway. We shot well and ended with the fourth highest Offensive Power Ranking for the event. 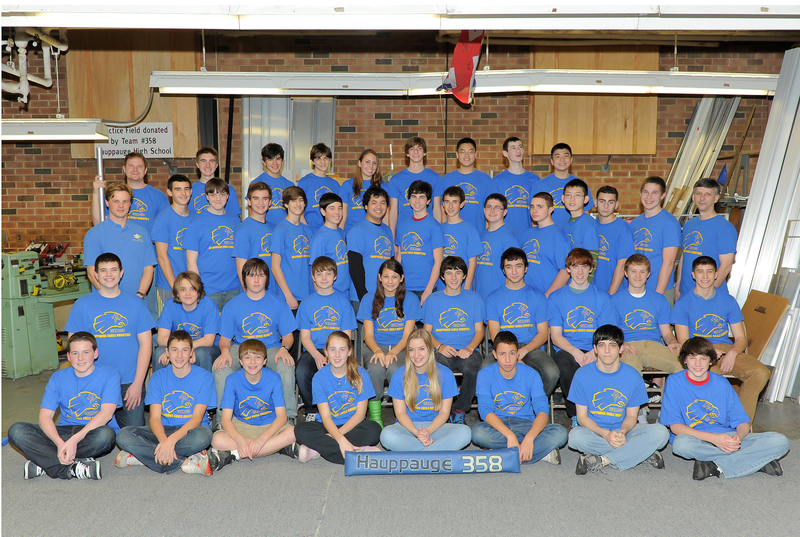 We Captained the 4th Alliance and chose Team 271 Bayshore and Team 533 Lindenhurst to play. We won our first Quarterfinal, but eventually lost the best of three. 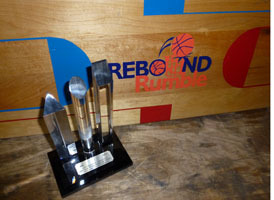 We didn't leave empty handed. We were awarded the Gracious Professionalism trophy for our work with the rookie teams and efforts at the event to get all teams running. 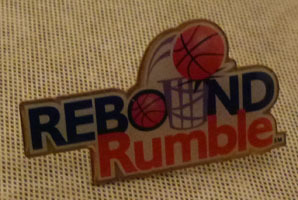 Finally, the Championship event held in St. Louis. It was our first time in St. Louis, so we did something a bit out of the ordinary by leaving a day earlier than normal to give us an extra day to sight-see. We stayed at the Drury Plaza at the Arch and many of us had rooms with close-up views of the Arch and walking distance from the Metrolink on a direct line from the airport. We used the Busch Stadium stop and had great views of the ball stadium as we walked alongside it. The weather was sunny and perfectly clear for kicking around the fields at the base of the Arch on Wednesday. We rode little cars up to the top and peered out the tiny windows at the top. Everyone liked watching the Arch's own shadow on the park below us at noon. A few days later we also toured the courthouse on the city side of the park where the Dred Scott case was first tried. Our hotel was about eight blocks from the Edward Jones Arena where the event was held and we walked each day. We did really well during the qualifying rounds in the Galileo division, that began Thursday right after lunch, remaining in the top eight all day and occasionally at #1. Friday went well until the last few matches when we dropped into the teens, finally finishing 20th after some missed opportunities for Coopertition bridge balances. We were the first pick of Alliance #2, but ended in the Quarterfinals with Team 492 from Bellevue, Washington and 2016 from Ewing, New Jersey.